House of Mutt Blog » Entertainment: Let’s Do This! Considering dogs were, once upon a time, wolf-type creatures, having them now live in towns and/or restricted to indoors is always going to provide its challenges. Some breeds are perfectly suited to this modern way of life we provide for them (you Shitzus out there, I’m talking to you) but others (hello, Cocker Spaniels) tend to need a little more … action. Action, and brain drain. In the news this week, there’s been talk of an indoor dog centre in Cardiff and a Central Bark dog cafe in Manchester - two places where you can let your dog loose in a warehouse full of toys while you sit and have a coffee and chinwag. Not for me, I fear. Dogs need fresh air and so do we – however much we may think otherwise when the weather is as it is today. Similarly unhelpful I think are the kind of care places where you drop your dog off in a large enclosed field/pavillion, where s/he can just run round all day. I’ve seen dogs exhausted by this approach – and not in a good way. 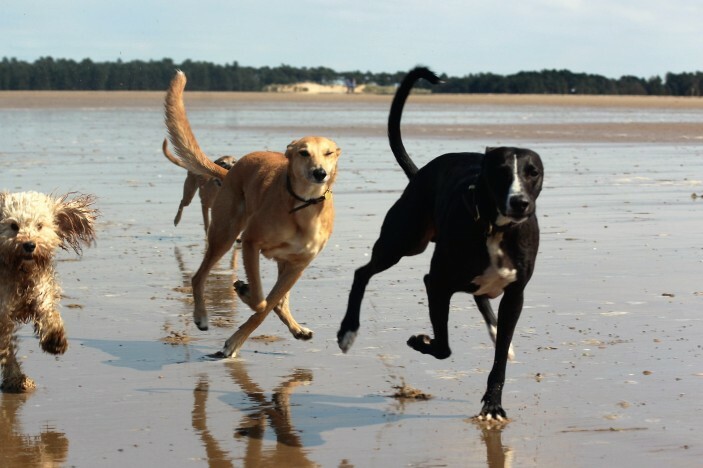 Dogs need stimulation and organisation, not just space. Play, sleep, mess around, sleep, think, run, sleep etc etc is a far better routine for a dog than just unfettered ‘freedom’. So, what kind of alternatives are there out there to help us best exercise dogs’ brains as well as their bodies? And how best to decide on which is best for your dog? As a general rule, the sharper the dog the more brain drain that’s required; the fitter the dog the more straightforward exercise. One of ‘our’ regulars, Rafa, (a Greyhound/Staffie, it’s thought) apparently goes to the dog track in Bicester where he’s allowed to run round the greyhound track after their famous Sealey Hare. He’s a speed machine and clearly LOVES the uncomplicated letting-off-steam opportunity that this track gives him. Two circuits and he’s done – ready to sleep for a week. The approach would be a disaster for a different kind of dog, but for him it’s perfect. Agility is another firm favourite, and one that would be better suited to a clever clogs as it enables them to think and run. It’s a fast growing sport and is something that can happily be run indoors. There are local clubs all up and down the country but I’d love to set up a serious House of Mutt London Agility Club one day – maybe an idea for the future? Spaniels, terriers, Cockerpoos, Collies – all can make excellent agility dogs. Then there’s dog running, CaniX. Husky racing. Doga for the more relaxed. And so on and so forth. But for those who are less keen on organised entertainment and prefer a more ‘au naturel’ approach, there are all sorts of games that can be played out on a normal walk. We play hide and seek, chop and change direction, hide fir cones for retrieving, explore in the bracken, mess around – all these things keep everyone on their toes, having fun and, most importantly of all from our point of view, sleeping soundly once they’re back home! So, dark evenings and wet weather notwithstanding (yuk), let’s get out there And Do This. Brrrrrr…. See you in the park!